An ankle fracture (or broken ankle) means that one or more of the ankle bones are broken. A fracture is synonymous with a break. The ankle is made up two leg bones (the tibia and fibula) and one foot bone (talus). Fracture of the leg portion of the ankle joint may create bone instability and the position of the ankle may shift, called a fracture dislocation – which is more serious. Ankle fractures are generally the result of a trauma or injury. The symptoms of ankle fractures vary depending on the extent of the injury. Generally swelling, pain and the inability to ambulate on the extremity are hallmark signs. Simple breaks may have mild pain/discomfort and patients may be able to put some weight on their foot. More involved breaks can be quite painful and patients can’t put weight on the ankle. Significant breaks may cause dislocation of the ankle. Some fractures can be extremely violent and the broken bone can pop out of the skin – called and open fracture which is a surgical emergency. Additionally, extreme swelling can be a surgical emergency as it can cut off circulation to the foot and leg. Ankle fractures occur from an injury to the ankle. Most common are rotational injuries to the ankle causing the ankle to snap and series of injury patterns have been identified. Inversion injuries are common where the foot turns inward on the leg and fractures the outside ankle bone. Falls from a height, landing on one’s foot, can also cause ankle fractures as the foot is pushed upwards into the leg bone. Simple slips and falls can cause ankle fractures as well as extreme sports. Some people with poor bone quality may develop stress fractures from weakened bones. As with any foot and ankle injury, it is important to seek medical attention. With ankle injuries and fractures, it is best to seek care immediately after the injury. Depending on your overall health, symptoms and severity of the ankle fracture, treatment can be conservative or with surgery. Conservative therapy usually involves some degree of immobilization in either a boot or casts with crutches (or not), depending on the severity of the fracture. Surgery is generally recommended when the bones are displaced and improperly aligned. With or without surgery, broken bones take 6-8 weeks to mend. The basis for ankle fracture surgery is to manually place the broken bone(s) in proper alignment, and to stabilize the fractured bones (often with screws and plates) while bone healing takes place. The location and orientation of the fracture(s) generally determines the method and type of fixation used to fixate the bone(s). The type of ankle fracture surgery depends on the involved bone(s), fracture orientation, displacement, separation of the bones, mechanism of injury and stability of the fracture/ankle. It is easiest to distinguish the method of fracture repair by the bone(s) involved – classified by the anatomical landmarks of the ankle bones called the malleoli – there are three: the medial malleolus, posterior malleolus, and the lateral malleolus. The tibia has the medial malleolus located on the inside of the ankle as well as the posterior malleolus located on the back of the ankle. 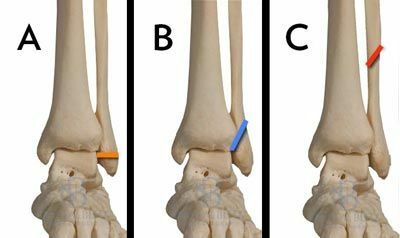 The fibula, which is the smaller bone of the ankle, has the lateral malleolus and is located on the outside of the ankle. Small/tiny chip fractures of the end of the ankle bone(s), whether on the tibia or fibula , are better classified as avulsion-type of fractures. The term avulsion refers to a ligament rupture at its attachment (or interface) to the bone. When a ligament is pulled or stretched to a significant degree, it may rupture in the midsubstance of that ligament, or it can rupture at the boney attachment. Ligament ruptures at the boney interface may be forceful enough to pull of a portion of the bone with it, and are classified as avulsion fractures. It is important to understand that, with avulsion fractures, the ligament is intact at its midsubstance and disrupted at its end attachment at the bone. Avulsion fractures often indicate severity of injury, and in some cases are treated similarly to a more defined broken bone. A lateral malleolus fracture is a fracture involving only the fibula bone at or near the ankle. 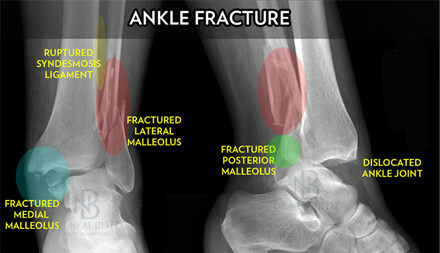 Lateral malleolus fractures are the most common type of ankle fracture. 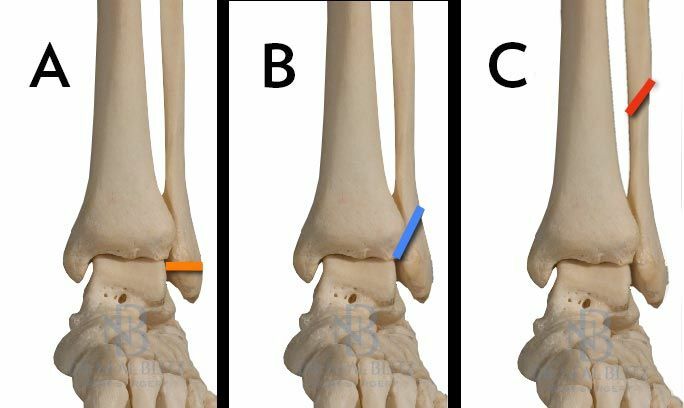 There are three locations of fractures involving the fibula, based on their relationship to the ankle joint line. Type A: below the level of the ankle joint line. Type B: at the level of the ankle joint line. Type C: above the level of the ankle joint line. Fibular fractures are most commonly fixed with metal screw(s) and plate(s). Generally there is a screw (or more) that crosses the fracture line along with a bone bone that spans the bone. A medial malleolus fracture is a fracture involving the inside of the tibial bone. These fractures are classified as ‘intra-articular’ as they pass through (or disrupt) the articular surface of the joint. Fortunately they tend to occur at the corner or side of the joint, which is less disruptive to the weightbearing part of the joint. 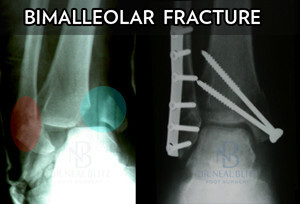 Medial malleolar fractures are commonly fixed with screws depending on the size of the broken fragment. Smaller fragments may be repaired with metal rods and wires in a technique called tension band fixation. Occasionally bone plates may be used with fractures that are long and quite oblique. A posterior malleolus fracture is also fracture involving the tibia bone, but only the back portion of it. These fractures are also classified as ‘intra-articular’ because they pass through (or disrupt) the articular surface of the joint. These fractures are commonly small and do not pose much risk to the weightbearing part of the joint. When the fracture invades more than 25% of the joint surface, the surgeons generally recommend fixing the fracture. Posterior malleolar fractures that go on to surgery are commonly fixed with screw(s) fixation, though small plates may be used. Posterior malleolar fractures tend to occur in conjunction with medial malleolar fractures and/or with lateral malleolar fractures – and sometimes can be aligned when those bone are realigned and repaired. The bimalleolar fracture, means fracture to the inside and the outside of the ankle – involving the medial malleolus and the lateral malleolus. These injuries are commonly less stable. Sometimes the instability is quite obvious, other times surgeons may need to illicit it by performing a physical maneuver to displace the bones. Some surgeons perform a test of walking to see if the bones move, indicating the instability. Unstable and or malaligned fractures are indications for surgery. Bimalleolar fractures that require surgery generally requires fixation to both the inside and outside of the ankle. The medial malleolus is repaired with rods and wires, or with screws. The lateral malleolus is generally repaired with screws and a plate, and fixation is determined on the severity of the fracture. An important part of the surgery is to not only repair the broken bones but to restore the normal length of the bones and their relationship to one another. The trimalleolar fracture, means fracture to the inside, outside and back of the ankle – involving the medial malleolus, posterior malleolus and the lateral malleolus. These injuries are commonly often unstable as all aspects of the ankle are broken. Unstable and or malaligned fractures are indications for surgery. Trimalleolar fractures often require surgery and generally involves fixation to both the inside and outside of the ankle. The medial malleolus is repaired with rods and wires, or with screws. The lateral malleolus is generally repaired with screws and a plate, and fixation is determined on the severity of the fracture. Trimalleolar fractures may also disrupt the stabilizing ligament and membrane (called the syndesmosis) that holds the tibia and fibula together – and is repaired with stabilizing screws (or strong sutures). Also, an important part of the surgery is to not only repair the broken bones but to restore the normal length of the bones and their relationship to one another. The bimalleolar equivalent fracture, means fracture to the outside of the ankle (lateral malleolus) along with deep ligament injury (or unstable chip fracture) to the inside of ankle (medial malleolus). These injuries are commonly unstable, and can be extremely elusive to diagnose. Sometimes the instability is quite obvious, other times surgeons may need to illicit it by performing a physical maneuver to displace the bones. Unstable and/or malaligned fractures are indications for surgery. Bimalleolar Equivalent fractures that require surgery generally requires fixation to the outside of the ankle involving the fibular bone. The lateral malleolus is generally repaired with screws and a plate, and fixation is determined on the severity of the fracture. Larger transfixion screws may be necessary to hold the fibula and tibia in place. 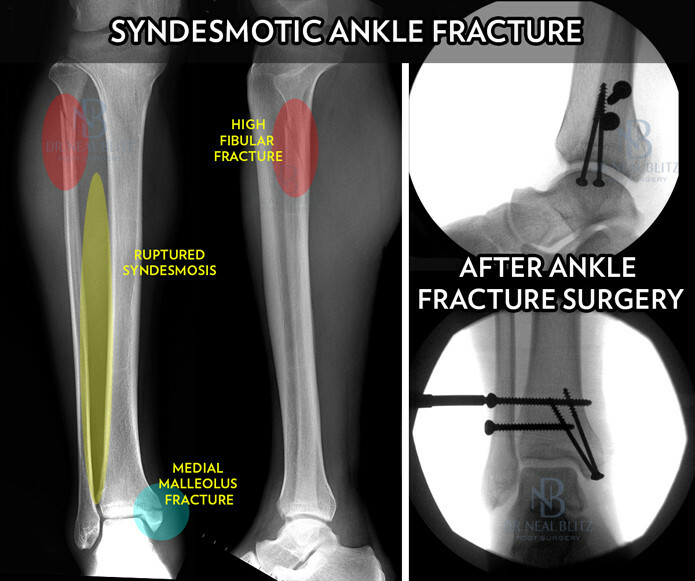 The syndesmosis ankle fracture involves injury to the strong ligament that holds the tibia and fibula together at the ankle and between the leg. Sometimes the disruption is obvious, other times surgeons may need to illicit it by performing a physical maneuver to displace the bones. The syndesmotic injury may be associated with various ligament ruptures surrounding the ankle, and with a high fibular fracture or a fibular fracture near the knee joint. Syndesmosis injuries that are unstable and/or demonstrate malalignment often requires surgery to stabilize the bones and re-establish the proper relationship of the bones. Surgery typically involves one or two large screws that are oriented from the fibula to the tibia paralell with the ankle joint line, but a few centimeters higher. Sometimes suture may be used when incorporated into special devices. When fibular fractures are present, the large screws may be placed within the bone plate. Recovery depends on the type of ankle fracture, extent of injury and hardware used, and several other factors. Sometimes patients may be allowed to weightbear in cast or boot, other times below the knee casts may be necessary along with a period of non-weightbearing. Once the bone is mended, a process that typically takes 6-8 to 12 weeks, physical therapy may be indicated. Depending on the injury and extent of surgery, it can be performed as an outpatient or an inpatient. Major ankle fracture surgery may require a hospital stay. Most ankle procedures are performed under regional, spinal or general. Local anesthesia is not typically effective for these surgeries. There are general risks associated with foot and ankle surgery (or any surgery) and the use of anesthesia. Complications may occur and are not necessarily your fault, or the fault of your surgeon. Nonetheless, you should understand the risks. Ankle Surgery complications include, but are not limited to: infection, pain (temporary or permanent), swelling, hematoma, bleeding, blood clot, poor wound healing, incision breakdown, poor bone healing (delayed union, nonunion), malunion, nerve injury, neuroma, pain syndrome, RSD, disability, recurrence, hardware problems, unsightly scar, stiffness, weakness, ankle arthritis, need for revisional surgery, and/or catastrophic loss.